Drunken Tiger, the godfathers of Korean hip-hop, recently announced that their latest album would their last one. Drunken Tiger — which debuted as a duo of Tiger JK and DJ Shine in 1998 and operated as a one-man band after DJ Shine left the group in 2005 — finished their run with Drunken Tiger X: Rebirth of Tiger JK. The album is notable for its featured artists, a Who’s Who list of the most important figures in the history of Korean hip-hop. There’s Yoon Mi-rae, the wife of Tiger JK and, like her husband, a Korean-American; MC Meta of the group Garion, the founder of Korea’s underground hip-hop scene; DEFCON, another leading figure of the underground; the rising stars of the new school Junoflo and myunDo, and, notably, RM of BTS, the world-beating K-pop band. This eclectic mixture reflects the history of Korean hip-hop. As with all Western-style music, hip-hop was an import into Korea’s pop-music scene. At times, the fact of this importation gave rise to the criticism that hip-hop in Korea was inauthentic. Such criticism, however, does not stand up to scrutiny. Hip-hop in Korea was an authentic expression of the identity of the Korean artists, who were responding to the musical environments in which they found themselves. Under the strict definition of “rap” as rhythmic speech set to music, Korean pop music’s first rap song was “Kimsatgat [김삿갓]” by Hong Seo-beom [홍서범] from 1989. But the first Korean rap song that enjoyed a meaningful level of popularity was 015B’s The Story I Want to Tell You [너에게 들려주고 싶은 이야기], from 1991. However, these pieces were one-off manifestations that did not leave a traceable legacy in Korea’s hip-hop history. To identify the wellspring from which the history of Korean hip-hop flowed, we must look to Seoul’s dance clubs in the 1980s. Korea’s first large-scale contact with hip-hop came in the clubs in the Itaewon neighborhood of Seoul, near the U.S. base in Yongsan. Initially, the Itaewon clubs were open to American soldiers only, as they catered to the U.S. GIs from the Yongsan base. But by the mid-1980s they became available for Koreans as well. The dance-music boom was in full swing at the time. Michael Jackson was a global sensation, paving the road that led to break-dancing and eventually Run-D.M.C. Seoul’s aspiring dancers congregated to these clubs to test their mettle. Particularly famous was the club Moon Night, which hosted citywide competitions for dancers who learned their moves from U.S. GIs and their families. A significant portion of the biggest dance-music stars in ’90s Korean pop — including Seo Taiji and Boys, Deux, CLON, DJ Doc, R.ef and Roo’ra — began their careers at Moon Night. The history of hip-hop in Korea did not begin with rappers and DJs; it did with dancers performing to New Jack Swing. Korea’s first hip-hop star was Hyeon Jin-yeong, considered one of the greatest dancers in Moon Night’s history. Hyeon’s career was a milestone in many respects: He was the first project of SM Entertainment’s Lee Soo-man, who would grow into a global behemoth that launched a thousand K-pop idols. Hyeon’s act, called Hyeon Jin-yeong and Wawa debuted in 1992, and was made up of a singer and a number of backup dancers. This formula would be inherited by Seo Taiji and Boys, and would eventually carry over to acts like Deux (pronounced “deuce”), which was made up of only dancers. In recounting the history of Korean hip-hop, the importance of Deux cannot be overstated. Deux was the first meaningful archetype of a hip-hop artist in Korean pop music. Deux’s eclectic collection of music — which ran through rap, Michael Jackson–influenced pop, New Jack Swing, and funk — reinterpreted through a Korean take on American hip-hop-presaged the genre-bending conventions of modern K-pop. The fact that the cradle of hip-hop in Korea was the dance club has deep implications that can be seen to this day in mainstream K-pop. As K-pop entered the international stage, the identity of Korean hip-hop as dance music flowed into the mainstream K-pop idol groups, particularly through the producer YG (a former member of Seo Taiji and Boys). From the start, YG Entertainment focused on creating idol acts rooted in hip-hop, such as Jinusean and 1TYM — until it found international success with Big Bang. As was the case with their predecessors in “rap dance,” there was plenty of heated discussion in Korea’s hip-hop community about whether Big Bang and G-Dragon could be considered truly committed to hip-hop. Yet there is no doubt that Big Bang was the moment at which Korean hip-hop first found a global audience. Korean hip-hop’s identity as dance music would cause a backlash of sorts in the mid- and late 1990s. Hyeon Jin-yeong, Seo Taiji and Boys, and Deux were hip-hop stars, as they introduced to Korea hip-hop’s beat, fashion sense, and attitude. But their music was dance music, quite unlike the rap-centered hip-hop in the United States. This apparent departure from the “original” American hip-hop caused a reaction, which principally came in two flavors: Korean-Americans who imported American hip-hop aesthetics, and Korea-born Koreans who explored the possibility of rap within their own language. Korean-Americans have always played a significant role in introducing black music to Korea. Korean-Americans’ English-speaking ability, American-style fashion sense, style, and attitude were considered a mark of their authenticity. It was in this context that Tiger JK and his future wife Yoon Mi-rae — then a member of a Korean-American hip-hop/R&B group called Uptown — began making names for themselves. 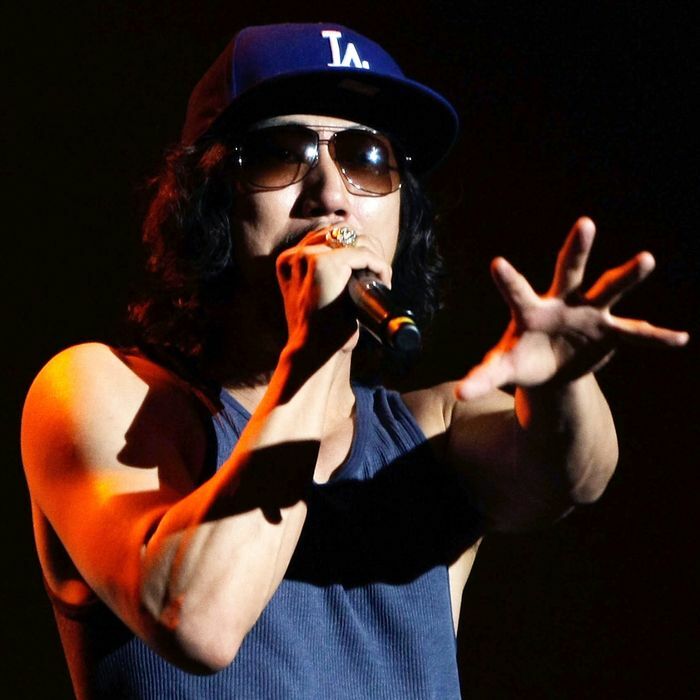 Tiger JK did more than lead Drunken Tiger to commercial success; he also formed the Movement Crew, the influential hip-hop community that gave rise to groups like Dynamic Duo, Leessang, and Epik High, who collectively planted the lyrics-centered hip-hop firmly in the mainstream pop music in Korea. Influenced by the U.S. underground hip-hop of the 1990s, and in particular by gangster rap, these Korean-American rappers sought to create raw and message-driven music. Meanwhile, Korean hip-hop fans began congregating at a place that never existed before: the internet, supported by dial-up modem in the late 1990s. The fans who rejected the “rap dance” that was then prevalent in Korea got together on a primitive online bulletin board. At first they listened to American rap music together, then they started making their own music. This is considered Korea’s first “underground” hip-hop community — a virtual community that birthed the likes of Garion and DEFCON. These underground rappers sought their own version of authenticity by crafting rhymes in the Korean language. Their first attempts were plagued with amateurism, until the breakthrough moment came in the form of Verbal Jint’s 2001 EP “Modern Rhymes.” Freed from the mechanical reliance on end rhymes (in which the rhyme kicks only at the end of a clause, creating a rap verse made up of a stack of sentences that rhyme only at the last few syllables), Verbal Jint found a way to change the speed and emphases of his lyrics to create parallel structures with clauses of different lengths. Much like the way Rakim pushed rapping beyond the simple rhyme patterns of the early 1980s, Verbal Jint used the Korean language to create three-dimensional and progressive rhyming structure, unlocking the potential of Korean language within the logical framework of hip-hop. By late 2010s, these three dueling trends — “rap dance” performed by K-pop idols, Korean-American rappers and Korean-language rap — would find their synthesis in BTS. BTS, of course, is a mainstream K-pop idol band, with plenty of intricate choreography. But as they emerged as rappers more than two decades after hip-hop first landed in Korea, BTS no longer needed to refer back to American hip-hop and worry about how their music measured up to the original. Instead, RM and Suga had plenty of precedents within Korean hip-hop itself; in their rhyme and flow, the influence of Epik High, Dynamic Duo, Verbal Jint, and Drunken Tiger is quite pronounced. BTS also had the advantage of creating their own music, which also did much to dispel the prejudice within the Korean pop-music community that idol-group rappers were not serious about hip-hop because they were mere products of their production companies. (In a recent interview, Tiger JK said he was disabused of the prejudice against idol-group rappers after speaking with RM at length — a high praise.) As with the Korean-American rappers, BTS’s music has been raw and authentic to their emotion and experience — a point that set them apart from most K-pop idols, who tend to be produced in a heavy-handed manner. And as with Korea’s underground rappers, BTS broke new grounds in exploring the possibility of the Korean language within the logic of hip-hop with songs like “Paldogangsan [팔도강산],” featuring rap in Korean regional dialects (rather than the standard Korean language). All the more reason why RM’s inclusion in Drunken Tiger’s farewell album puts an appropriate coda to the group’s career.